One of my friends practically shoved this down my throat. There were phrases thrown out like, "It's so good! You'll love it!" and,"It's better than the Fever series." I was really hesistant to read it, because, quite frankly, I didn't think anything could be as good as Mac and Barron, but I'm really glad I was wrong, because it was just as good. 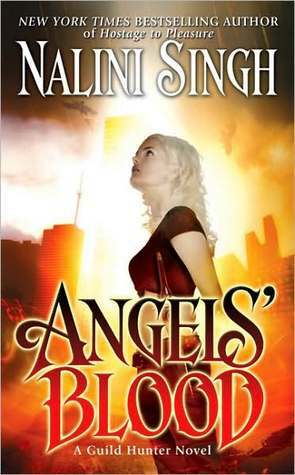 Now, I'm before I continue, I'd like to briefly point out that Angels' Blood good is on whole other spectrum than Harry Potter good, and that's that. I was skimming through the goodreads reviews and I saw a gif that was a complete representation as to what I was feeling at the time. I could fangirl for the rest of this post, but instead I'll stop. Angels' Blood is not only an amazing romance, but it's filled with action, witty banter, mystery, murder, crime, fantasy, hot guys, a strong feminine heroine, and everything else that makes up an amazing book. So, you may wonder, why I didn't give it 5 glasses? Well, there were some things that I didn't like about it, abet, they were tiny, but they made me give it that -.01. First off, the romance was a bit too fast. I knew this was supposed to be a series when I started reading, and I like my romances slow, but it was almost instant satisfaction - granted its towards the end of the book - but whatever. There where other little minor things like the weird twists and stuff, but I can totally over look those minor flaws. So yeah, in teenager speak: THIS. BOOK. WAS. AWESOME.